Somewhere in the dark jungles of the Andes mountains lies a Dimensional Bridge which leads to a violent, medieval world ruled by Magic of the Blackest sort! Fortune hunter Tyler Flynn enlists fellow ex-pats Ambrose Bierce and Amelia Earhart in a desperate attempt to break free from the diabolical orbit of... the Lost Planet. 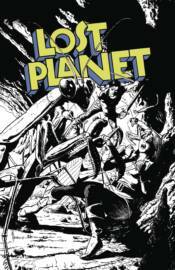 The long awaited fantasy opus/reboot Lost Planet from Author/Artist Bo Hampton is returning in a hardcover edition in glorious, living Black and White! Although The six-issue mini-series from 1984 was printed in color, Hampton's line art was done on craft-tint Duo Shade board-a long gone tonal process not seen since the heyday of E.C. Comics. The laboriously plotted, and lavishly illustrated, tale draws upon fantasy and classic pulp tropes for inspiration but remains completely unlike anything in comics, before or since.